A 43-year-old Horncastle man hit a man he accused of texting a former girlfriend, a court has been told. Darren Alexander Harris, of Dovecote Alley, admitted assaulting Thomas Lyons by beating him on May 20, when he appeared at Skegness Magistrates’ Court. 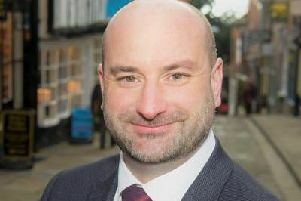 Jim Clare, prosecuting, said Mr Lyons had been having a drink with friends in the Kings Head public house in the Bull Ring in Horncastle, when Harris tapped him on the shoulder and asked him to “come outside”, adding “nothing’s going to happen”. Mr Clare said that when they went outside, Harris said “I’ve told you not to text her and you have” to which Mr Lyons responded that he would continue to do so as long as she replied to him. Harris then hit him on the head causing a cut on the bridge of his nose and swelling and bruising under his left eye. Mr Clare said that Mr Lyons had merely been texting a former girlfriend and that there was nothing more to it than that. Mitigating, Rachel Woodcock said Harris had issues regarding alcohol and violence and suggested a report from the Probation Service. Magistrates agreed and adjourned for sentencing on July 14 and ordered a report from the Probation Service.